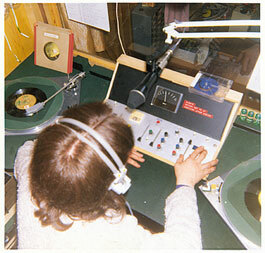 Radio Kaleidoscope started life around 1970, in Southend-on-sea in Essex. The brainchild of Colin King who had been heavily involved in the famous Trafalgar Square free radio rally in August 1968. At the rally Colin met Maurice Ogden who was a offshore pirate fan, and radio engineer. Maurice built a transmitter and several broadcasts were made in Southend but Colin had much bigger plans. Late in 1972 he discovered that there was a group within Radio Jackie in London who were unhappy with the way Jackie was sounding at the time, and they wanted to broadcast a more professional sound. Colin wanted to start a polished professional sounding station and he arranged a meeting with the Jackie dissenters. The meeting went well, and the group decided to broadcast to London every Sunday on 266m with the name Radio Kaleidoscope. The first transmission was on March 3rd 1973 with a tightly formatted fast paced top 40 sound. DJs included ex Jackie men Dave Owen and Pat Edison. Broadcasts continued every week. Radio Kaleidoscope was probably the first tightly formatted music station on the British mainland. Commercial radio was still months away, and the operators only had experience of listening to the old 60s offshore pirates, so they decided to look to the US for programme inspiration. Although they had decided to opt for a top 40 format, the team were keen to be first with the new sounds and as a result they developed their own musical identity as many of the records they picked failed to become hits. The station had a distinctive poppy AOR sound. The studio had originally been built for Jackie's VHF service and was located in Pat Edison's bedroom. The programmes were very heavily compressed and recorded onto cassette tapes. 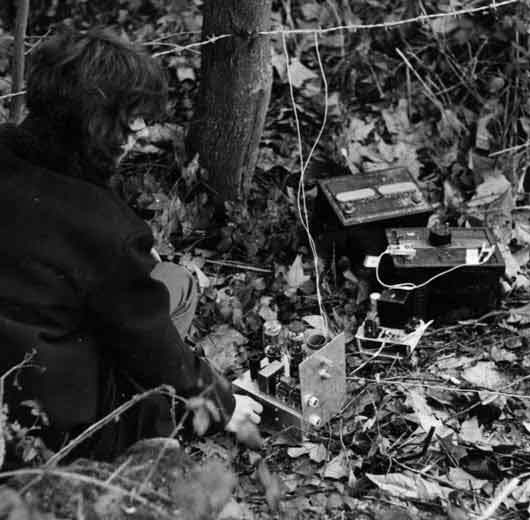 These tapes were broadcast from the transmitter which was set up in a field with the aerial supported by trees. Very quickly the Big K, as the station became known, established itself as the number 1 pirate in London. From time to time the Post Office would raid the station, but this was seen as an occupational hazard and the Big K always returned. Later in 1973 Kaleidoscope started a Thursday night VHF service on 94.4Mhz. Called K-FM it replaced Radio Star in the LTIR network. It added a great strain to the workload of the station and consequently several broadcasts were missed as the main effort went into the MW Sunday broadcasts. In those days far more people listened to MW than FM. When Britain finally got legal commercial radio in October 1973 the LTIR closed their network down, and K-FM closed with it. Dave Owen unpacking the transmitter on location - apparently this transmitter was built on a Saturday night/Sunday morning, taken straight to site with little testing and in the middle of the day one of the smoothing caps exploded with a loud bang and lots of smoke. The transmitter continued to work, only no one would go near it to change tapes. Early in 1974 Dave Owen left Kaleidoscope to work on the offshore station Radio Atlantis which broadcast for a few months from the Belgian coast. He later joined Radio Caroline and then went on to a professional career in ILR. In spite of this loss, Kaleidoscope continued as London's top pirate. By then the Big K had developed its own style, with the original brash US presentation giving way to a more informal relaxed sound. The pace may have slowed, but programmes were still very slick and polished. Pat again, this time tuning up the twin 807 transmitter. The unit in front of the car battery is a transistorised inverter which converted the 12 volts from the car battery into about 350v for the valves. Early in 1975 there was a split in the station, when several members left to set up City Sounds. This was a bad time for Kaleidoscope, and several broadcasts were missed, however they eventually got things back together and the station continued. Around this time a new programme was introduced, and at noon every Sunday Kaleidoscope presented Music Week: a hour of music and radio news, plus a look at the new releases and the station's chart, the Big K Tip Top Thirty. The 1/4" masters of many of the 'news' sections of these programmes survive, and provide a fascinating look at the music and radio scene in 1975. 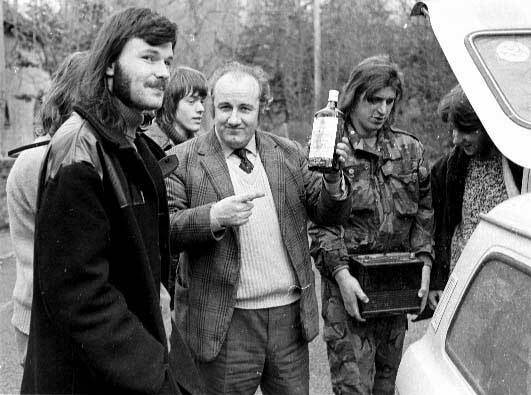 Also in 1975 Abie Cohen decided that legal ILR stations which had started in 1973 did not meet up to expectations, so he decided to re-open the LTIR. This time, Kaleidoscope was to provide the Tuesday night slot. Unfortunately the LTIR network did not return to it's previous strength, and few of the Tuesday evening programmes on VHF took place. At this time the IBA began tests on 1151KHz, which were to cause a great deal of interference to the Big K. In March 1975 Kaleidoscope tried moving a channel further away to 1124KHz, but it was not enough, and at the end of December they moved to 1358 KHz, announced as 226m. By the beginning of 1976 Kaleidoscope was struggling to find enough staff to put out the Sunday broadcasts. This problem became severe in early February, and eventually the operators felt that they didn't want The Big K to become unreliable and die slowly. Instead they decided to close the station permanently, and on February 22nd 1976 Radio Kaleidoscope made it's final broadcast. This included an hour long look back at the history of the station. Packing up after the final broadcast. Brian Horne (aka Abie Cohen) prepares to commemorate the end of an era. Also featured are Steve Hampshire and Bob Kelso. Many pirates could be identified by holes in their clothes at waist level - caused by battery acid residue when carrying batteries like this. Radio Kaleidoscope was undoubtedly one of London's most professional pirates. At a time when commercial radio in Britain had not quite established itself, Kaleidoscope sounded considerably more exciting. It is a testament to the high quality of the programming on the Big K that several of their presenters would go on to long careers in legitimate radio. If you have any recordings of this station please contact us so we can add them to our archive and they can be enjoyed by others. 57:22 a programme from the original Kaleidoscope in Southend. Probably late 1970 or early 71. The Geater (an impersonation of Larry Tremaine who broadcast on RNI). I'm not sure which May bank holiday weekend this was ? Can't remember anymore, everything's a haze from them day's !! I guess it could have been May day,'cause I only did two BH transmissions with Radio Kaleidoscope. Anyway, I had been on site at Chessington for the Sunday broadcast and the station was put of air by a visit from the "old bill". Someone had reported seeing some young men in a field with a box with wires coming out of it and decided to phone the police. Anyway to cut a long story short, Olly and Mark Lawrence who were standing by the rig were caught after a chase, but the rig was hidden in the long grass during the chase and wasn't found. They were taken to Chessington nick to help the police with their enquires. Pat and I got away in Bob's car after crashing though the woods onto the road. It would be a good time to go and make a cup of tea, this could take a while.....Where was I ? Oh yes, the next day was bank holiday Monday and K had planed a broadcast from Tottenham from Phil Marshall's estate, the same site he had used for WFRL. [ed: The Broadwater Farm Estate]. Mike Baldwin (K's engineer) Mark Lawrence (Fresh out of the nick) and myself met Phil at the Elephant & Castle and he took us up to Tottenham, where in the early hours of the morning we rigged the aerial for the next day's Kaleidoscope transmission. Phil took us up to the small block with the rig and cassette players etc and we left Mark there. Then we came down across the estate to the entrance of a high tower block, where Phil and Mick would go up and pass down the side of the building the aerial wire tied to a screw driver, which I would take, walk along the walk way to where Mark had lowered some heavy duty line, which I tied the aerial to and then Mark pulled the whole thing up in the air........Phew !! At 0300 Kaleidoscope came on the air and covered SE England with Phil's 60 watt WFRL transmitter, with Mark Lawrence doing his first programme for the Big K.
During the morning the other site crew turned up (including Olly) and during the broadcast, Mark, Phil and Olly took turns at doing the tape changes at the top of the hour. At some point Abie (Mr.H) arrived and I went with him up to Alexander Palace to check the harmonics of the signal. It wasn't good, we counted about six of them, all very strong !!! The end result was at around 1530(ish) the station was raided by Eric and Co and the estate was swarming with police. I telephoned Pat, who was recording the request programme, which was to go out between 1800-1900 and told him about the bust.